When we are talking about the incorporation of various design features that would make the building green, it is not just the expensive materials that consume less energy or are less energy intensive. Earlier we discussed various Active and Passive features to be incorporated to make the building green without increasing the cost of infrastructure by purchasing expensive green materials. Following green principles and design features that would make the building energy efficient and green also results in Sustainable Development which has become the prime need of the time. Rainwater Harvesting is one such design feature that is to be incorporated in any kind of building; be it a commercial or residential complex. 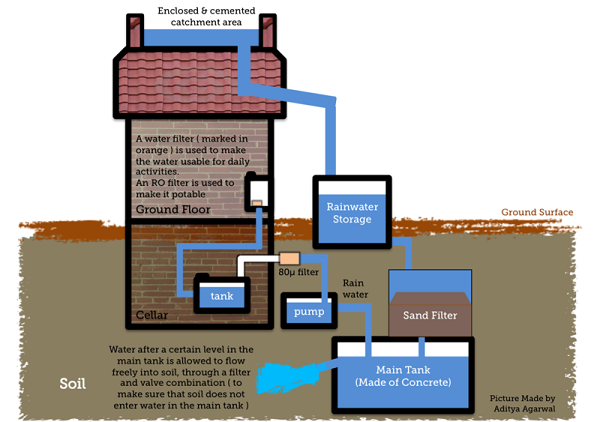 Rainwater Harvesting is a technology in which individual building or a group of buildings collect and utilize rainwater during the rainy season. This water can be stored in storage tanks and used for non-domestic purposes. The builder and the Architects are now becoming aware of the need for water conservation are making provisions for harvesting rainwater to increase the underground water table. Provisions have also been made for the recycling process of water thus helping conserve precious water and reuse it in an efficient way. 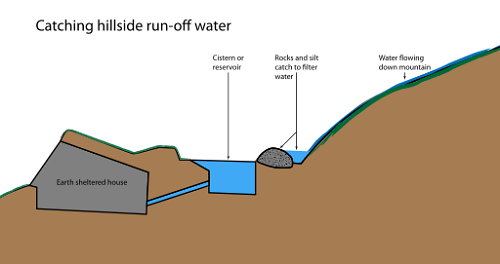 In a rainwater harvesting system, a storage tank is required which can be a part of the underground water tank or separate tank on the surface. This tank collects water falling on the building terraces. The main purpose of rainwater harvesting system to collect and store rainwater falling on the ground which can be further be used in the future. If the ground is hard, the rainwater does not seep into the ground and is thus not brought into use. Rainwater harvesting pit is an ideal solution for such problems. The increasing population has resulted in increase of the use of the water consumption. This is hugely faulted by the showers we take says Shower Headly an eco-friendly shower head manufacturer. The water table has gone down considerably. Hence it is necessary that we make an attempt to store rainwater and use it in the best possible way. This entry was posted by Benzu JK on September 18, 2010, 9:05 am and is filed under Sustainable Design. You can follow any responses to this entry through RSS 2.0. Thank you for this great post. We could very well use rain harvesting methods here in the Philippines, as we experience a lot of flash floods in most of our metropolitan cities during rainy season. Cheers always. Nice article. We’ve been thinking about how we can be more “green” at our company. We are looking at a system like this in our manufacturing to reduce the use of city water and electricity. Wonder how hard this would be to add to a current house? Your idea about this green building was really interesting. It’s really helpful for the sustainability of our environment.It’s really the “prime need of time”. Thanks a lot for sharing this post. I am really amazed of Rain water harvesting, it is really essential nowadays because of increase in water consumption.